No Hassle, Without the Hassle The whole point of a buzz cut is that it's low-maintenance, but if the sun turns your scalp the same shade as a certain undying prop comic's hair, you'll get serious skin damage, which requires a lot more maintenance than giving your head some Axe Buzzed. Take this easy step to help protect your dome from harmful UVA/UVB rays, and keep your scalp from peeling -- a major turn-off for girls, dermatologists, and girl dermatologists. No Woman, No Cry Women (and most small children) find rubbing a buzzed head irresistible, like rubbing a Buddha belly, except less uncomfortably close to the area known as the "Buddha under-belly". While other allegedly similar products leave cabezas greasy/oily -- making the ladies think you've played some sort of gooey trick on them -- Axe Buzzed Look Cream leaves your dome perfectly dry, so admirers won't feel like they're saving storks from the Gulf. Get more deets at AXE's Facebook page, then cop the Cream faster than... well, according to cartoons, the animal to beat is the mouse. 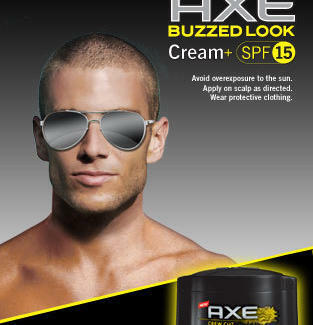 Defend your dome from sunrays and greasy messes with AXE Buzzed Look Cream + SPF 15 *Avoid overexposure to the sun. Apply on scalp as directed. Wear protective clothing.